This precious gift was in my inbox this morning when I woke up at 5:45. 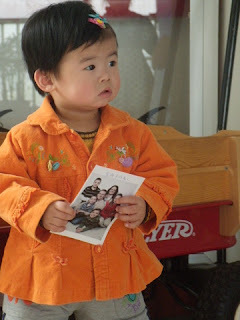 The sweet family that went to her orphanage on April 12th was kind enough and requested to take pictures of three of the kiddos that are waiting for families. I was not certain that we were one of those families. There was an email yesterday that she did get pictures of LuPing and two other babies and she promised to have the pictures emailed to us last night. Well, we waited up until after midnight and there was no picture. Well.......Jeremy got up for work this morning at 5:00. I was sleeping until about 5:30 and woke up and laid in bed for about 10 minutes. I couldn't take it any longer and meandered downstairs. I found Jeremy with my computer on the couch and he was going through my email! I laughed at him as he could not figure out how to enter my Yahoo! group, which is where the pictures were being stored. And if you didn't get enough of her sweetness in the above picture, here is yet another. This is such a sweet picture of her and her expression is so serious. Notice the picture in her little hands? Yes, that is our family picture. 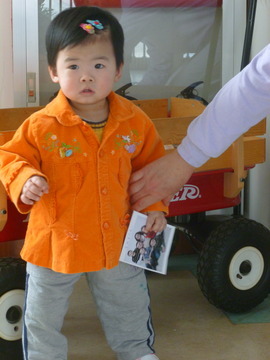 Her orphanage did give her the care package we sent and she is holding the picture. We were told that the nannies were pointing to our pictures and showing her "Ma Ma" and "Ba Ba". This did my heart so much good. This process has proven to bring out emotions in my hubby as well. As we scrolled through all 22 pictures, I was crying. Then I looked over at Jeremy at 5:30 and he was wiping tears from his eyes as well! It is safe to say she already has "Ba Ba" wrapped around her little fingers. Here are a few more of the pictures we received. Enjoy!!! It appears that Mariah may have just begun walking as she seems a little unsure. I think she also may have been overwhelmed by all of the attention. We also ordered an update from an independent company in China. We placed that order on Tuesday and finally on Saturday afternoon we received a small update. I was thrilled!! to know what size diaper to take. We are certainly relieved to have a fairly good idea. Along with the update we did receive two other pictures. One was blurry but Mariah was smiling! That was the first "happy" picture we have seen. The picture to the right is Mariah and one of the Half the Sky nannies. I love how happy the nanny is and it seems like she really loves Mariah. I think I forgot to mention that we did receive our I800 immigration approval on Wednesday too!!!! We are inching closer and closer to our baby girl. We still hope to travel in June. There are just a few more steps left in the process. This part of the process is getting Mariah's paperwork legal for her to become a U.S. citizen upon landing in the U.S. I have finished my homeschooling for this year as well. The kids are still working on finishing up some of their independent work. This will go for just a couple of more weeks. But they have finished their history, science, spelling, Bible, and literature. They still have math and Language Arts to finish up. It feels so good to have this year behind us. The stress of our adoption and Ben's health issues have drained us. Through it all, God is still so good! We trust Him to give us the wisdom we need as parents. I am so tired as we have had a crazy week. Monday, Jeremy and I began our shots for our trip....Hep A, Hep B, and Polio. Kyle also had his allergy shots on Monday and Micah was seen due to his horrible allergies/sinus problems. Tuesday we had family pictures for our church directory. Thursday was nice as my parents drove down from Pittsburgh to stay with our kids while we took Ben to Cincinnati EARLY Friday morning. That was a long day....8+ hours in the car. I may write a little more later this week but for tonight, I need to go. I do have math and Language Arts papers to grade before the kids start their day tomorrow. I will leave you with one of the countless verses that have been a comfort to me throughout this race to bring Mariah home. I think one day I will post a blog on just the verses that the Lord has used to convict and encourage us on our journey. For tonight I will leave you with only one. Praise the Lord, O Lord, you are my God; I will exalt you and praise your name, for in perfect faithfulness you have done marvelous things, things planned long ago. You can probably guess that we are doing a bit more of the waiting. Seems as though we never can get fully used to the idea. Our I800 immigration form was received at the lockbox in Texas and accepted. This just means they check to make sure it is filled out properly and not missing signatures then it gets mailed to the facility in Missouri. That is were it sits right now. I emailed our immigration officer last night just to give her a heads-up that our application will be on her desk very soon. She was kind and emailed me back this morning letting me know, in her very formal way, that she is on the look out for it and will let us know if there is anything additional needed to grant us provisional approval. The good thing here is that the I800 applications are expedited, always. So, we are praying to have that approval by next week. To the left is a quilt that was made for Mariah. I absolutely love it! It is a large quilt that I am certain she will become quite attached to. I tried to get a close up picture of this quilt. A sweet lady made this for her and decided since we were adopting a little bit older of a child, she would make it larger. LOVE the colors!!! Here is a full view of this beautiful quilt. Isn't it lovely? I have begun "nesting". It is just necessary cleaning and reorganizing to make room for Mariah. Last weekend I spent cleaning out Rebecca's other dresser making room for Mariah's things. Mission Accomplished! I had all three of the kids' bedrooms a mess while having them try on clothes to see what fits this year. I had four unhappy, unimpressed children. So glad that job is done! Mariah now has a dresser and a small portion of Rebecca's closet to share. To the left is a picture of a very special package we received in the mail. 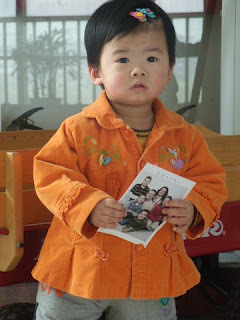 One of my adoption friends was in China (adopting two of her own) and she sent this to us. She had Mariah's name done in calligraphy in both English and Chinese. The man that does this is a Christian and owns a shop on the famous Shamian Island. This is in Guanghou, where all American adoptions are finalized. His name is Jordon. He is a very outspoken Christian and loves to do this calligraphy for Americans....free! Unfortunately, a couple of weeks ago Jordon found out that his shop was being shut down. He wanted to stay and last we heard they were going to allow him to have his shop up on the fifth floor, instead of on the street level. Those traveling for their adoptions now cannot find his shop. I am so thankful that my friend was thinking of us as she was there for her children as well. This is precious to us. In the picture above, you will also see Chinese money. She sent us this money for us to have to purchase snacks once we land at the airport and to pay for bellboy tips! We called our local (or should I say Ohio's) health department and found out about our travel immunizations. Looks like the CDC recommends Typhoid shots, Hep A and Hep B shots (series of three shots, one month apart), and Polio boosters. There is a Polio outbreak in China right now. So, we need to get started immediately and we will not be able to get the last Hep shots as we will not have enough time. Hard to believe those shots will run over $400 for both of us! WOW! My brother just traveled to China and he was able to take the Typhoid orally. Maybe that is an option since the health department only has 5 shots left and they are all spoken for. The school year is wrapping up for us. My unit study material is finished next week!!!! The kids still have math, language arts, and a few other things to finish up after that. I am more than ready to be done for this year. It has been a school year with much added stress and anxiety. We all need a break. Reading about Archimedes the past two weeks somehow just does't seem all that interesting. Not sure that it ever would though. We are ready for a clean bill of health for Ben as we visit Cincinnati next Friday. I am frustrated with the lack of communication within the medical community. He needs to start back on his growth hormone so he doesn't lose any more ground. He certainly looks healthy!! He eats more than our teenager, Kyle. Jeremy and I are praying that his blood pressure is normal this time. The last several visits have shown elevated blood pressures. I think it is anxiety, even though you would think he was used to it all. I think I forgot to mention that we invited my parents to come to China with us. We had suspicions that they (mostly my mom) wanted to come. So my sister told me I should ask. Well, my mom practically screamed when I asked her. She said she'd call back later. Evidently, she called my dad in from the garage and she was crying begging him to say yes. So, that is the story of how my parents decided to come. Mom has told me several times that she wants to be there to support Jeremy and me. Jeremy and I both know that she wants to personally witness our "Gotcha Day" with Mariah just as she has been at the birth of all of their sixteen (yes I said 16) grandchildren. As far as my dad is concerned, he just loves kids and retired several years ago. After my mom begged, he said, "Sure! Why not!" Well, I can think of several reasons but if he is willing to take his first ever international flight/travel to China for 2 weeks to meet his newest granddaughter, I'm not saying a word. Let's just say he will probably frequent McDonald's while there. I'm glad someone else will be there to film those first moments and Jeremy and I don't have to take turns filming each other. Jeremy has already said he fully intends on being the one to hog her the entire time. We'll have to see. I think he forgets what this mommy is like with her babies! We may fight over Mariah! The way I see it is, we have been pregnant for 15 months now. This labor has been far worse than the labor of our biological children! There, I said it. Keeping in mind, Becca was born without any medication and I still say that! We are praying that my next post will be about our immigration approval!!! This is pretty much where every important adoption document has been kept for a little over a year now. Honestly, I could probably use a file slightly larger, but I have thinned it out a little. Really, EVERY SINGLE PIECE of paper in this file is absolutely necessary for an international adoption from a Hague Country! Some files are also stored on Mariah's thumb drive. It is mind boggling to say the least! This nice little collection of paperwork went out by FedEx on Monday evening to our agency. This is our immigration paperwork/application. All in all there were about 30 pages of documents that had to be signed then copied before FedEx'ing. I had a tough time with the I800 (immigration) form. One of the areas to fill in was the address of Mariah's orphanage. Sounds simple, right? WRONG!!!! The orphanage moved about three years ago. I had two addresses and no clue which was correct. Our agency was closed for Good Friday and I had no way to know for sure. I emailed our agency, my Yahoo! orphanage group, the company we used for Mariah's care package, another mom adopting from our orphanage, and my adoption mentor. My agency got back to me Friday night and said to leave the address blank. So, that is exactly what I did. I just hope it was fine. I think it is but time will tell. We also mailed out our Visa applications with passports to a trusted courier in Chicago. The applications were 4 pages long and fairly simple. We are just praying that our brains were working properly at 2am trying to finish those up so we could get them out ASAP! Here are a few pictures of some of the work we did on grant applications. Some applications required a large amount of work. We had to provide reference letters, statement of professions, W-2's, income tax returns, and usually personal statements of our adoption testimony and our faith. It was fun to connect with Jeremy in this way. After 16 years of marriage, I did learn a lot about him! His parents played a huge role in his salvation. I love hearing him retell that story! What a legacy was left for our children. Here is just a little more of the work that went into financing this adoption. We only dreamed that we could do this debt-free. God worked in a very mighty way. We put hours into this part of the journey. A journey it has been! I wish I would have thought to take a picture of the actual paperwork that was necessary. Take my word for it that we probably used an entire forest! This is the last of the mailings! We don't have final numbers yet, but we have seen first-hand how God provides. It required a very difficult leap of faith, but we did it! As part of our celebration for our official approval from China, Jeremy's brother, Jeff, came down and helped celebrate. He wanted to treat everyone to dinner at Cheddar's. So, on Saturday we loaded everyone up in the van and had a yummy dinner! We had a great waitress and she took our picture. She was so excited when she found out what we were celebrating. So......as it stands for now, I'm completely confused as to the next steps. Don't get me wrong, it is clearly spelled out on several websites. But when you start talking about receiving the pdf of our I800 approval from the NVC (National Visa Center--honestly, I'm surprised I know what that is) then our Article 5 drop-off and pick-up, we then wait for our TA (Travel Approval) but cannot schedule any flights until we receive our CA (Consulate Appointment), I'm a little confused. I think we plan on riding on the shirttails of those who are a step ahead of us. I'm glad I have met some of them online and they can help us! Please keep us in prayer as we complete this journey. We are so close to the end. I cannot wait to wrap my arms around that sweet baby girl and smell her sweet "babyness" and give her kisses. I can almost smell the Johnson and Johnson baby wash and lotion I used on our other kids. Just to have those chubby little fingers on my neck is almost too much to process. But we are getting closer. Just to snuggle that sweet child in my arms makes me almost physically hurt to have her home. This is what an LOA looks like! This tiny red seal is what the entire adoption hinges. We have it after only 59 days! We were not at the top of the waiting list for LOA's with our agency or in the adoption world in general. It sure is bitter-sweet. I have friends that have been waiting longer and are still waiting. However, they are so sweet and assured me that I was not to let them steal our joy. My heart still hurts for them though. It seems as though there is little fairness in adoptions, foreign or domestic. Thankfully, Mariah's Chinese name and orphanage were spelled correctly. Our names were listed and spelled correctly as well. Now we can send this bit of paperwork on to US immigration and wait for our TA--Travel Approval now. We are told to expect to travel 10-12 weeks from now. My heart's desire is to travel and be back in the U.S. for Rebecca's tenth birthday on June 28th. So, please pray this for us. It is not impossible, but it is also not likely. She would love this as a birthday present as well. The phone call for our LOA came last Wednesday and Lifeline overnighted our LOA to us for Thursday. We were and are on cloud nine! As I was getting ready to back out of the garage to take Kyle to Morgantown for his ENT appointment, the FedEx truck pulled up! I jumped out of the van and ran up to the truck. I think I scared the poor woman! Stalking is something we do in the adoption journey. We stalk our mail carriers, our UPS delivery drivers and FedEx drivers. I have stalked timelines for other adoptive families, Facebook groups for adoption and anything else adoption related. The weekend was beautiful! We had gorgeous weather and company for Easter. We had friends over for our Easter dinner on Friday evening and Jeremy's brother also made the 4 hour drive to WV to spend the weekend spoiling our family. The only thing missing was Mariah! I got to work. Up until 3 am Friday/Saturday, we were filling out our I800 application for U.S. immigration. Our goal was to send that out Saturday. Well.....that didn't happen. Of all things, we could not find the address of Mariah's orphanage! We actually found three addresses and had no idea which was correct. We cannot risk send paperwork that is incorrect, so we had to wait to get clarification. Only to find out that we can leave that blank! We had to print a copy of Mariah's medical report (14 pages) and each had to sign every page. We had to copy the picture pages of our passports, send a signed copy of our original Letter of Intent (letter we wrote asking permission to seek adoption of Mariah back in December), and the DS 230 form for Mariah's visa/alien registration in the U.S. We also had another immigration form I864W that was a fairly simple one page paper. These all got put together to be sent to Lifeline by FedEx overnight.....today. Tomorrow LL should get that sent to USCIS! At the same time we are working on our Chinese visas. Those are not too difficult. They do consist of 4 pages for each application. We are using a courier in Chicago to do that for us. The U.S. Consulates require the visa applications to be hand carried. The picture to the right is a picture of what our school days are like. Rebecca decided this particular day (Wednesday) was a good day to be a pirate! She spent almost the entire day dressed like this. I honestly think it is adorable. One day she will lose that innocence. I'll soak it all up while it is here. And here is Becca's counterpart! Our British soldier, Ben. The outfit has a fluffy white shirt, redcoat, three-corner-hat, white knicker pants, and weapons. These weapons are often Nerf dart guns, Star Wars light sabers, swords, or cap guns. None of which are appropriate to the period! But as Ben sees it......why should that matter! To answer any questions, YES THEY SWORD FIGHT! And YES, SOMEONE ALWAYS GETS HURT! We are always up for a little excitement here! It is not always easy walking this road that the Lord has put us on. He calls us to be faithful. We have miserably failed so many times. We continue to be blessed as we watch the Lord work. We are starting to get a grip on how our adoption has affected others. Yesterday at church I was talking to a sweet friend and she began to cry as I was sharing a little about Mariah. The same thing happened last week with a different friend. I had no idea how her life would affect the emotions of so many outside of our own family. This is a child we have never met. A child that is not just a little girl in China. She is our daughter! I could cry at the drop of a hat, but to see others do the same means so much to us. I am beginning to understand how deeply we are all loved. I don't mean my family, I mean everyone. I have been touched this past weekend also by a sweet friend, Karen. She and her husband are adopting a little girl who is about 9 days younger than Mariah and they are sitting beside each other in the pictures of Mariah's cake. 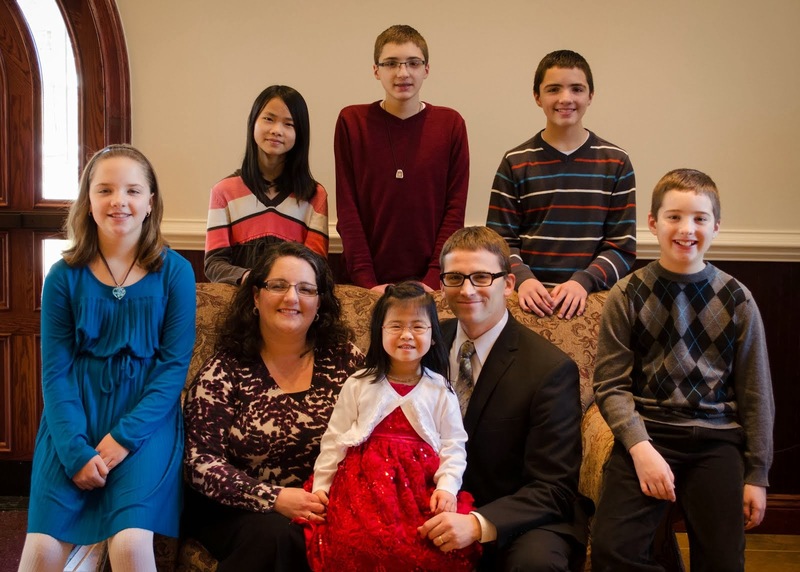 Karen and her husband have waited many years to have children and they are so close. She is waiting for her LOA any day! I pray that we can travel together. Karen has never met me but she is so sweet in our emails and asking about our children. We consider our girls sisters! God has been good! !